Your profile picture and headline are two of the most important and most viewed elements of your profile. Instead of ‘Open to New Opportunities’, use your headline to give a quick summary of your background and the type of position you are seeking. One example of this could include ‘Experienced Loan Officer Seeking Position’. Adding a summary section to your profile would allow you to give an overview of your experience and explain more about types of positions that interest you. You could also attach your resume to this section to provide your full background to interested future employers. Consider asking trusted colleagues for recommendations that you can list on your profile. This will give more insight into you, your abilities and your character. 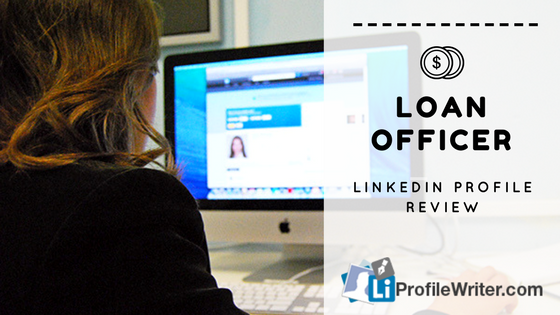 You might be also interested in our marketing director Linkedin profile review. Fill out all the fields given for your company including a logo of the company and a banner to promote your business. Write a short summary of about your company and put it under a good heading or phrase like ‘about us’. On LinkedIn, people can search for a business using words so always use keywords that describe your business. Always write your description without making any grammatical mistake and never leave it incomplete as these can have negative impacts on your profile. Take time to request LinkedIn recommendations. Recommendations from people you have worked with carrying a lot of weight. Getting your foot in the door of your dream job can be a challenge. These tips and advice will help you with your application process and interview, as well as who you should be networking with to break into the field. This expert advice also delves into what a typical day in the life of this profession is like. Loan officers work in the financial sector and help residential and commercial clients with loan applications, approvals, and modifications. They work in banks, mortgage companies, financial institutions and some private organizations. Your resume is your first impression. Create a resume that clearly highlights your goals, talents, and relevant experience so that employers can spot this information right away. Loan officers use a variety of financial tools and software to aid them in performing their duties. Typical job responsibilities of more than 65% loan officers include cultivating and maintaining healthy and profitable relations with their clients, increasing revenue for the organization and walking customers through various aspects of the loan application and approval process. Loan officers have to maintain a high level of financial expertise, professionalism, tact and organizational skills to succeed in the field. Your resume objectives should also highlight your communication, administrative, marketing, and managerial skills to convince the hiring manager that you are the right professional for the job. Focus on reading the content straight from the first word to the last. Make corrections (grammar, spellings) either by using online tools or hiring professional. Update the status and change the headline at least twice a week. Our group is composed of resume and profile writers who are experts in developing online profiles in LinkedIn and other online media. We have helped thousands of applicants including loan officer job seekers across places. Our expertise includes highlighting the best parts of your experience, making the companies recognize your potential as one of their future members. We ensure that profile stands out from the rest of other applicants by using the appropriate and correct keywords that companies are looking for. Our experts give your online profile a higher chance the advantage among pool of applicants. We help you get noticed by companies. We give you the possibility to get hired. We also display your best and most professional profile photo so that companies have the picture of a person who is dedicated to work as a loan officer. We put you into character and develop your online profile as a personality who can face the hiring manager during the actual interview.